Let’s just be honest about our superficiality. Even when it comes to the high-­minded business of literature, people do judge books by their covers. Perhaps that’s why Amazon produces glossy mock “covers” for its disembodied e-books, to be inspected and decided upon alongside the traditional print offerings. Book covers may be especially important when it comes to the classics. After all, many of us have a general sense of, if not a thorough familiarity with, the contents within. Perhaps more than anything else, these covers show what matters to prospective buyers. Two centuries of Jane Austen’s “Pride and Prejudice” are particularly revealing about the novel’s broad and sustained popular reach…. – the article links to a slide-show of twelve covers here – this will be in the print edition on Sunday. 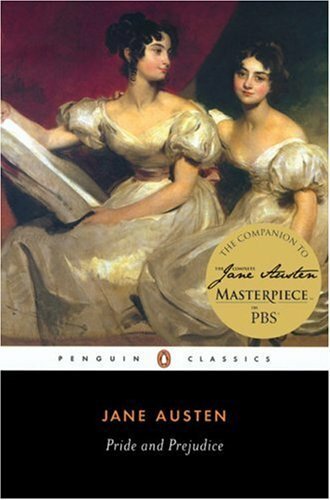 This entry was posted in Austen Literary History & Criticism, Books, Jane Austen, Jane Austen Illustrators, Jane Austen Popular Culture, Publishing History and tagged Book Cover Art, Book Design, Book illustration, Jane Austen, Janine Barchas, New York Times, Pride and Prejudice. Bookmark the permalink. Thanks so much for posting this! 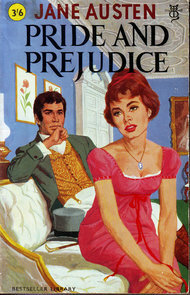 We who love Pride & Prejudice just can’t get enough of it, can we? We’re also blogging about it throughout this year, and I will have to direct our readers to your site so they can get what you’ve posted. We’ll be releasing a P&P alternate book of our own this year that we’re very excited about… I’ll let you know when it’s out. These are a laugh riot! I think the one with Lady Godiva is my favorite and probably the farthest from the sensibility of the novel. Very very fun and funny. Oh me oh my.